The Ribble Way provides a ready-made excursion into many of the geological landscapes of Lancashire and the Yorkshire Dales. These short geotrails provide a way of exploring them. A geological guide to the whole route is planned for the future. The Ribble valley’s oldest rocks are sandstones and limestones which were laid down 410-510 million years (Ma) ago in the Ordovician and Silurian periods. 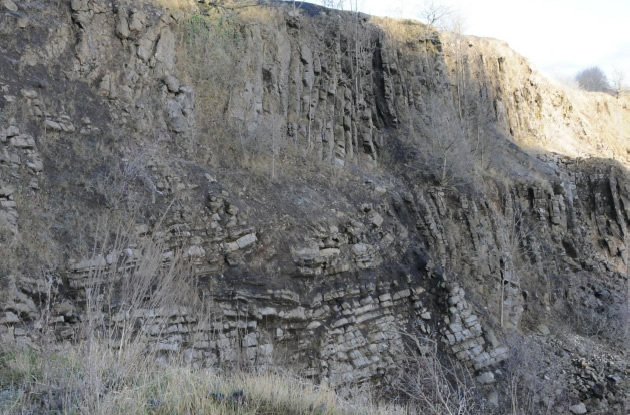 They have been affected by folding and faulting during their long history. Around Horton-in-Ribblesdale and Stainforth these processes uplifted the older rocks to the surface, where today they are quarried for roadstone at Horton and Ingleton. You can download the geotrail guide and background information below. However, the trail guide is designed as an A3 document which folds down to A6. You will have to print it in sections if using an A4 printer. All these notes focus on limestone found in the Clitheroe area. For those who want to know more about the huge range of ancient and modern carbonate sediments, there is an excellent and highly readable text book by Tucker and Wright (see references). The appendices contain more detail about local limestone sediments and fossils. 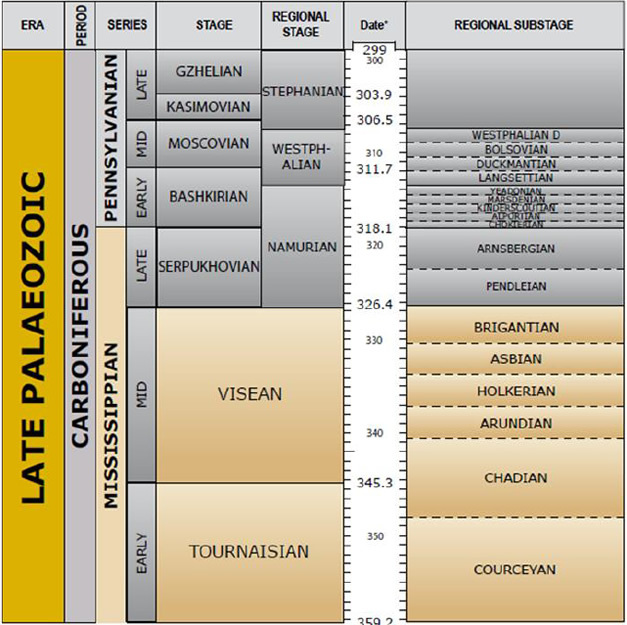 Figure 1: Stratigraphy of the Carboniferous (British Geological Survey on-line time chart), providing a basis for Figure 2. The British Geological Survey website gives the latest internationally agreed definitions of stratigraphy, together with dates in Ma (million years before present), see Figure 1. Much of the early study of Carboniferous limestone was undertaken in Belgium, hence Tournaisian and Visean. The words Namurian and Waulsortian, which will be used later on, are also of Belgian origin. Figure 2: Stratigraphy of the strata exposed near Clitheroe. Hiatus means a pause in deposition. Figure 2 shows the stratigraphic context of local rock formations. The limestone seen on this Geotrail ranges in age from about 350 to 335Ma. As far as the Carboniferous limestone sediments around Clitheroe are concerned we must put ‘coral reefs’ out of our minds. Today’s coral reefs are not analogues for the depositional environment of the carbonate rocks at Clitheroe. Even today’s coral reefs are not entirely made of coral. 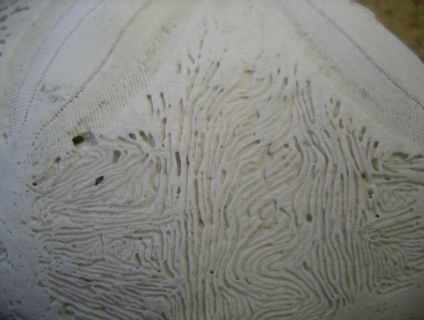 Coral provides the framework but most of the binding is the result of carbonate precipitation by algae. About 50% of the carbonate in the Great Barrier Reef in Australia has been produced by algae. 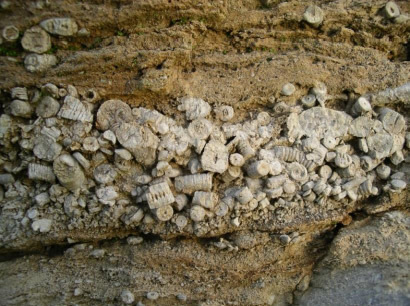 Fossil corals are found in the limestone near Clitheroe but they are relatively uncommon and are not closely related to modern ones. Carbonate from crinoids and algae makes up a substantial proportion of local limestone. Crinoids and echinoids are unusual in the way they use carbonate in their hard parts. The molecules of carbonate are organised in the form of perfect calcite crystals, like Iceland Spar. 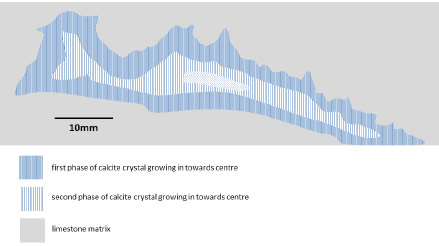 When these calcite crystals are broken they fracture along cleavage planes, which are planes of weakness in the crystal, see Figure 3. The small fracture surfaces are flat and reflective and are easy to see on a fresh surface. 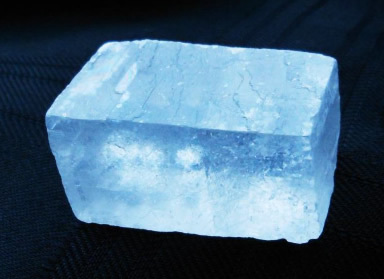 Figure 3: A prism of Iceland Spar, which is composed of calcite, bounded by cleavage planes. The smooth surfaces of cleavage planes reflect light. Reflections from ‘mirror like’ fragments in limestone usually indicate the presence of crinoids. Two principal depositional environments are responsible for the limestone seen on the Geotrail. The Chatburn Limestone, seen in both Cross Hill quarry and the Hanson Cement’s quarry was deposited on a ramp, a shallow angle slope from shore to deeper water uninterrupted by a reef. The Trucial Coast of the Arabian Gulf is a modern analogue, subject to the reservations that the biota was different in the Carboniferous. The gradient of the Trucial Coast ramp is only a few metres per kilometre. During periods of high flow the rivers Tigris and Euphrates discharge terrestrial siliciclastic mud far into the Arabian Gulf, some of which is deposited on the ramp. In the north of England tectonic processes in the Carboniferous caused crustal stretching and the formation of basins, subsidence of which provided space for many hundreds of metres of sediment to accumulate. In the Tournaisian and early Visean (see Figure 4), when England was located close to the equator and the influx of siliciclastic sediment was low, conditions were favourable for deposition of carbonate sediments. 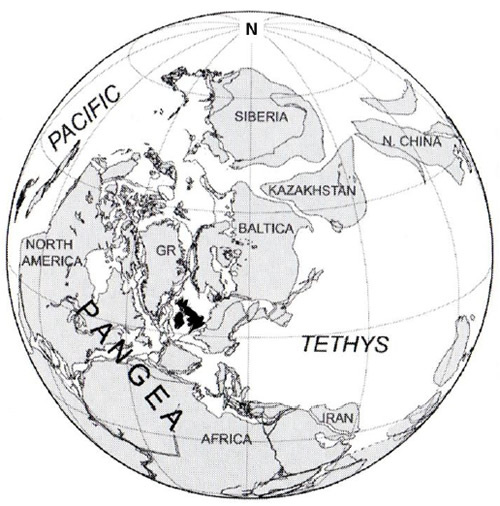 Figure 4: Reconstruction of the position of the continents at about 300Ma. The UK is located just north of the equator. In what is now the Clitheroe area, the sea water would have been warm and clear. Occasional ingress of siliciclastic mud from the hinterland caused hiatuses in carbonate production. These were responsible for the muddy partings which highlight the bedding in the Chatburn Limestone. Contamination with siliciclastic sediment and organic carbon is the reason for the dark colour of the Chatburn Limestone. In later Carboniferous limestone successions some muddy partings are the result of volcanic ash falls. Siliciclastic mud brought nutrients and minerals into the basin and increased biological productivity. The source of all local carbonate rock is biogenic. Most is formed in shallow water, an area known as the carbonate factory. Productivity in the carbonate factory limits the rate of deposition of carbonate sediment. Today carbonate productivity around, for example, the Bahamas and Florida has largely kept pace with sea level rise. The rate of deposition in inner Florida reef tract has been as high as 2.3m per thousand years but only about 1m per thousand years for the outer reef. Average rates in the Carboniferous are very much lower than this. The rate of crustal stretching increased during the early Visean and the ramp became a steeper slope. 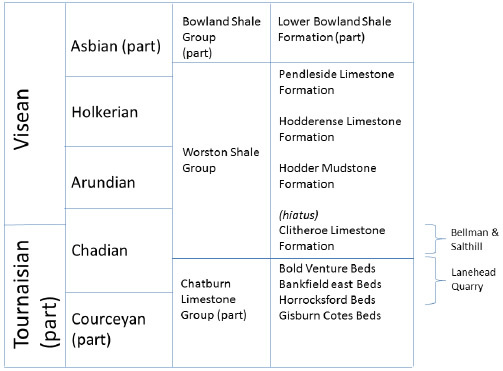 In this setting the limestone and shale of the Worston Shale Group were deposited, commencing with the Clitheroe Limestone Formation, see stratigraphic log in Figure 2. The Clitheroe Limestone Formation incorporates Waulsortian mud mounds. The mound at Salthill quarry extends into nearby Bellman quarry. In the Ribble valley Waulsortian mud mounds are exposed in a line, running approximately east-west. Worsaw Hill and the Castle mound are two prominent examples. The total area occupied by this aggregate of mud mounds is less than 25km2. The line of mounds formed along a slope, parallel to the shore, with deeper water to the south. It has been proposed that this arrangement of mounds was a result of nutrient-rich sea water upwelling from the south. Such a hypothesis, although entirely reasonable, cannot be applied to all aggregates of mud mounds. Those found in Northern Ireland are up to a kilometre thick and occupy an area of about 30,000km2. In accordance with geological convention these mounds are known as Waulsortian after the type locality in Belgium where they were first formally described. The term Waulsortian should only be applied to mud mounds of Carboniferous age although similar calcareous build-ups are found from the Cambrian to the Jurassic (between circa 520Ma and 180Ma). The origin of mud mounds is uncertain but a consensus is emerging that microbial activity was responsible. 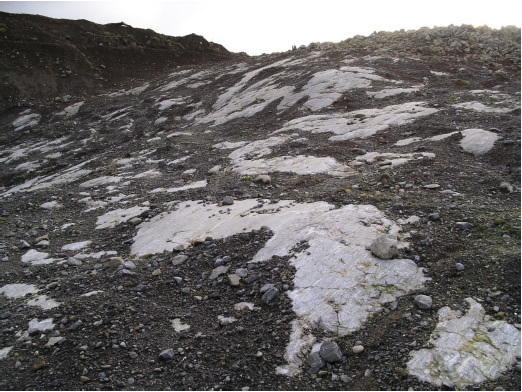 Microbes cannot extract carbonate from sea water directly but it seems likely that microbial mats formed on the surface of the mound and provided a micro-environment in which calcite (calcium carbonate) was precipitated by other mechanisms. The process of mound formation and its conversion into a solid structure would have been contemporaneous. Once cemented the mound was able to achieve considerable relief above the sea floor without being eroded away by submarine currents. Waulsortian mud mounds formed in relatively deep water out of reach of sunlight so symbiotic green algae, found in modern corals, could not have contributed to these build-ups. Waulsortian mud mounds are characterised by lack of bedding and by the presence of stromatactis. Stromatactis is defined as a geopetally-infilled and cemented cavity with an indented roof, see Figure 8; the cavity was probably formed early in the cementation process, but there is no consensus on how it was formed. Figure 5: Diagrammatic sketch of stromatactis. It has been customary to treat mud mounds as entirely different entities from framework reefs, such as modern coral reefs. Rachel Wood, in her paper entitled ‘Are reefs and mud mounds really so different?’ compares ancient mud mounds with modern coral reefs. She makes the point that even today’s reefs, which are perceived to be dominated by corals, are bound by micrite (micro-crystalline calcite), which may contribute up to about 80% of the rock. We should accept Wood’s findings that coral reefs and mud mounds, rather than being formed by very different processes, are members of a spectrum of rigid carbonate build -ups. Beds with abundant crinoid debris flank both Bellman and Salthill mounds, see location 3. It is likely that crinoids flourished on the tops of the mounds and were occasionally washed off by storms. For more about crinoids, see Appendix 6. The amount of subsidence during the Carboniferous period is difficult to comprehend. 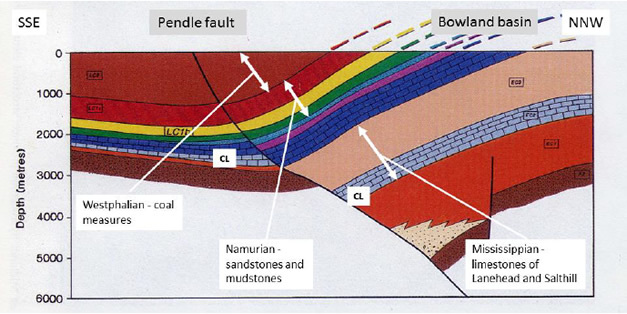 Figure 6, based on seismic data, shows that today the Pendle fault extends more than 4000 metres below the ground. The basin, like several other Carboniferous basins in the north of England, is in the form of a half-graben. The displacement of the Chatburn Limestone shows that during its deposition the movement on the fault was about 1500m. The Chatburn Limestone is about 400m thick (Earpe, p22) and the Clitheroe Limestone Formation above it varies in thickness from 100 to 1000m (Aitkenhead, p12). On top of that were more than 2000m of deltaic sands and muds deposited during the Namurian and Westphalian. Subsidence created the space for such vast quantities of sediment to accumulate. Namurian sediments are preserved on Pendle Hill, but near Clitheroe those sediments have been eroded away. During the Mississippian England was moving northwards from just south of the equator. Later in the Carboniferous, during the Namurian, a vast delta system filled the half-graben with sand and mud. The river carried sediment from huge mountains to the north, part of a range which stretched across what has become Norway, Scotland, Greenland, Newfoundland and the northern Appalachians. Only when the half-graben was almost full of sediment did water depths become uniformly shallow. What followed, during the Westphalian, was a tropical delta with areas above sea level upon which flourished luxuriant forests, the origin of the coals of southern Lancashire. By this time England was located in the tropical wet belt, north of the equator. Later, compressional tectonic processes resulted in regional uplift after which the Pendle fault was partially reversed and a great thickness of uplifted material was removed by erosion. It was during an earlier short term compressional episode that the Horrocksford Hall Thrust, Geotrail location 6, came into being. During the Namurian and Westphalian ice caps waxed and waned at the poles and sea level varied by at least 100m. Most of the southern North Sea is less than 100m deep, so it is not difficult to imagine the impact on depositional environment of such changes. The limestone of the Waulsortian is well cemented and the rock is strong, hence the present local topography. The most recent glacier/icesheet in the Ribble Valley passed over and around these mounds and preferentially eroded weaker rocks. Evidence of its passing is seen in the rounded topography, the ice scratches on the top surface and the presence of till (boulder clay), all of which can be seen at Bellman where the till is up to 5 metres thick, Figure 7 and Figure 8. Figure 8: Ice scratches on the surface illustrated in the previous figure. Castle House, built in the sixteenth century and rebuilt from the cellars upwards in 1742/3, is now part of Clitheroe Museum. Many of the stones in this building contain layers of chert. The precise source of these building stones is not known. They are probably from the Pendleside Limestone Formation, see stratigraphic log Figure 6, but the location of a convenient local quarry is not known. In those days transport of the stones would have been by packhorse. The texture of rock within mud mounds tends to be homogeneous with no sign of bedding. As you walk up the road to the Castle (and museum) part of the mound is exposed in the cliffs on your right hand side. On the left, just as you enter the Castle grounds, some blocks of limestone pavement have been brought from elsewhere for use as decoration in the flower beds. It is now illegal to remove limestone pavement from the countryside. The United Reformed Church is one of several buildings in Clitheroe in which crinoidal limestone has been used for decorative purposes. The blocks of limestone came from Salthill Quarry and some very similar material can be seen at location 3. The matrix weathers more quickly leaving the crinoid fossils standing proud because the calcite crystals of which they are formed are more resistant to dissolution by acid rain than the rock matrix. 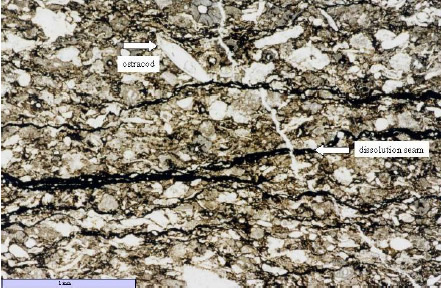 The contrast between crinoid fragments and matrix is particularly well displayed in Figure 9. 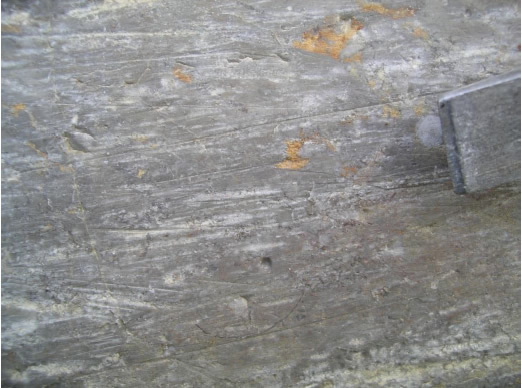 Figure 9: A spectacular example, from Bellman quarry, of crinoids weathering proud of the limestone matrix. The mud mounds of Salthill, Worsaw Hill, the Castle mound, etc. are part of the Clitheroe Limestone Formation, see stratigraphic log Figure 2. For those who want to study the rocks of Salthill Quarry more thoroughly, the Salthill Quarry Geology Trail guide is available from Clitheroe Museum. The limestone exposed here is the Chatburn Limestone, the same as crops out in Hanson Cement’s quarry. On old maps a lime kiln is shown on the nearest side of what is now Hanson Cement’s car park. On Pimlico Road, on the Clitheroe side of the Black Horse public house, can be seen the remains of two lime kilns. Inside the kilns are cylindrical chambers and what you can see from the road is the short tunnels to the base of the chambers from which quicklime was discharged. For more about lime kilns, see the background document on lime kilns on GeoLancashire’s website. If you follow the river bank north from Cross Hill quarry there are ‘rapids’ in the river about half way between the two bends in the river. This is almost certainly the line of the Horrocksford Hall Thrust, which will be seen at location 6. At low water, several folds in limestone of the Worston Shale Group are exposed in the river bank and out into the river bed under the bridge. These exposures are quite special, as exposures of folded limestone are uncommon locally. The compressional forces which created the Horrocksford Hall Thrust, seen at Location 6, have buckled the limestone at this locality. On the far side of the quarry and towards Chatburn the bedding in the Chatburn limestone is picked out by muddy partings. At the highest point on the quarry face at the Chatburn end of the quarry a dark shale band intersects the ground surface. This band is known as the Four Foot Shale and separates the Bankfield East beds from the overlying Bold Venture beds. This point is on the line of the old Chatburn Road; the other end is at the top of the tree-lined promontory on the far (east) side of the cement works. In the quarry face stretching to the left (northeast) of the viewpoint the bedding is contorted and at the viewpoint itself a fold, in which the dip rapidly changes from about 30º to vertical, is exposed. The plane of the Horrocksford Hall Thrust must be under the bridge, as the mudstone exposed on the river side of the bridge is Worston Shale Group, which is higher in the succession than the Chatburn Limestone, see stratigraphic log Figure 6. In this mudstone can be seen thin calcareous beds containing crinoid fragments. Although described as a thrust it may better be described as a reverse fault as, if the slip plane was at a low angle one would expect to see signs of the thrust in the quarry floor. Examples of the folding north of the viewpoint are shown in Figures 10 and 11. Figure 10: Folding in Chatburn Limestone, seen from viewpoint adjacent to Horrocksford Hall Thrust. 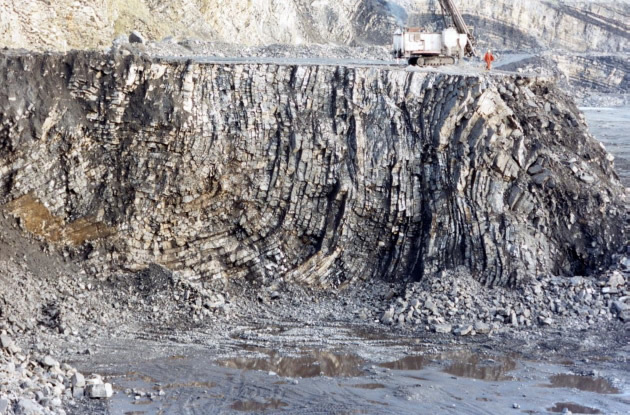 Figure 11: Picture, taken some years ago, showing folding in Chatburn Limestone. In the background are two prominent shale bands, the one behind the drilling rig folded. Image courtesy of Keith Hall, quarry manager at that time. Aitkinhead et al., 1992. Geology of the Country around Garstang, Memoir of the Geological Survey. HMSO. Bowden A, et al., 1997. Salthill Geological Trail, Geologists’ Association Guide No. 58. Jointly published by the Lancashire Wildlife Trust and the Geologists’ Association. Earpe J R et al. 1961. Geology of the Country around Clitheroe and Nelson, Memoir of the Geological Survey. HMSO. Fraser A J and Gawthorpe R L, 1990. Tectono-stratigraphic development and hydrocarbon habitat of the Carboniferous in northern England. In: Geological Society Special Publication No 55. Tucker Maurice E and Wright V Paul 1990. Carbonate Sedimentology, Blackwell. The mineral name for calcium carbonate (CaCO3) is calcite. Sediments containing calcite are described as calcareous. 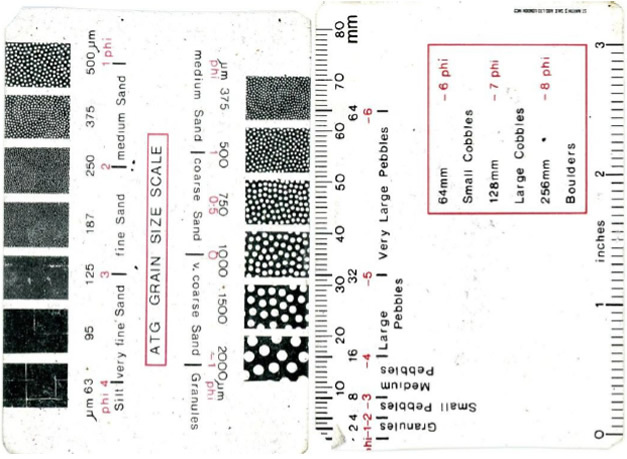 Figure 12 gives definitions of particle size. Figure 12: Standard dimensions used in the description of sedimentary particle size. Mud sediments may contain both carbonate and siliciclastic components. The muddy partings between beds of purer limestone in Lanehead quarry consist of both components. When such a mixture becomes rock it becomes a calcareous mudstone. Mudstone with a tendency to be fissile, i.e. to split along planes of weakness like slate, is usually described as shale. The word shale tends to be used, rather loosely, even when evidence of fissility is sparse. Bedding planes are the evident partings between layers of rock. Bedding planes are easy to see in outcrops of sandstone, mudstone and limestone near to Clitheroe, see Figure 13. The partings in limestone usually consist of calcareous mudstone or shale. 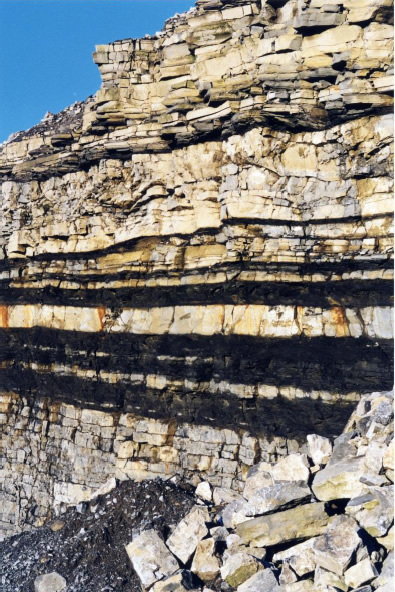 Figure 13: Bedding in Chatburn Limestone, showing several prominent shale bands. Below the thick shale bands the beds in the limestone are by separated thin beds of shale, commonly described as muddy partings. When a succession of beds is displayed in an outcrop it is tempting to think that the thickness of the beds represents the time taken for the sediment to accumulate. However, the thin mudstone partings between the beds may have taken much longer to be laid down than the limestone. The same can be said about the muddy partings common in local sandstone of Namurian age, such as the Pendle Grit. Imagine the sea floor a kilometre or so out to sea from the front of the Mississippi delta. Here mud would settle slowly out of the water column. It could be a very long time before the thickness of mud built up even to a few millimetres. Next imagine that heavy ‘monsoonal’ rainfall resulted in a huge volume of water flowing down the river. In one or two days large volumes of sand would be transported out to sea, covering the mud with, say, a metre of sand. As the river flow rate decreased, conditions would return to the normal slow deposition of mud. If the sediment were later turned to rock and exposed on the surface you would see a metre thick bed of sandstone sandwiched between muddy partings. It is clear from this simple example that thickness of sediment and time for deposition may not be closely correlated. Calcium and carbon dioxide in solution are ubiquitous in sea water. Under normal conditions dissolved carbon dioxide, which in solution is slightly acidic, suppresses the precipitation of calcium carbonate. 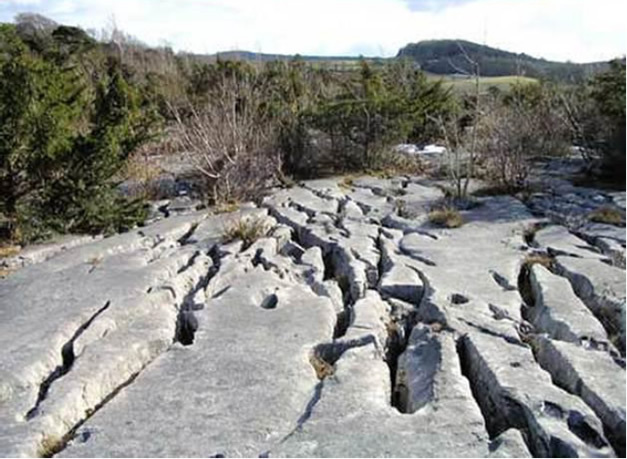 The action of carbon dioxide in acid rain is clear to see in the rounded ‘dissolved’ surface topography of limestone pavements, Figure 14. Figure 14: Limestone pavement at Gait Barrows National Nature Reserve near Silverdale, Lancashire. Biological processes produce solid calcium carbonate from solution in sea water, but they do not act alone. Any process that removes dissolved carbon dioxide is an aid to biologically mediated production of solid carbonate. In highly agitated water such as found at a coral reef, carbon dioxide is released into the atmosphere. 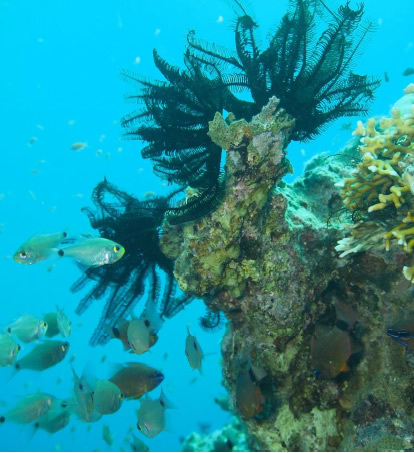 In addition, warm water retains less carbon dioxide in solution than cold water, so conditions at tropical coral reefs are favourable on both counts. 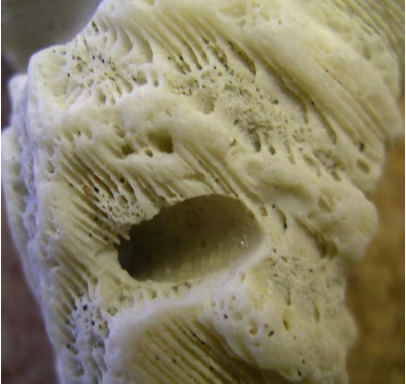 Organisms extract dissolved carbonate from sea water to make hard parts. Organisms also use carbon dioxide as a raw material for their soft organic parts and in doing so locally reduce local carbon dioxide concentration. This process also promotes direct precipitation of carbonate. Sponges extract silica (SiO2) from sea water and are the likely source of silica found in limestone. How this is expressed in the rocks will be described later. The area of high carbonate productivity is known as the ‘carbonate factory’. The main contributors to the carbonate factory in the Carboniferous differ significantly from those of today, so comparisons with today must be treated with caution. The predominant biota contributing to local Carboniferous limestone includes crinoids, algae and microorganisms. Many carbonate producing organisms feed by filtering organic matter from sea water. These are intolerant of siliciclastic mud, which interferes with feeding. It is no accident that modern carbonate build-ups, the Great Barrier Reef , the Bahamas and many more, are remote from sources of terrestrial sediment. Concurrent with deposition is erosion. Both coarse and fine carbonate sediment result from the comminution (breaking up) of shell fragments for instance. Comminution is caused by mechanical abrasion and by the activity of microorganisms. Endolithic algae, which are those living within a rock matrix, bore into carbonate fragments and make them more fragile. Bio-erosion was and is ubiquitous, see Figures 15a to d. Bio-erosion by endolithic algae is on too small a scale to see in these photographs. Today pilot fish eat coral polyps and in doing so generate carbonate mud, especially via faecal pellets which are also produced by other animals. Figure 15a: Modern bio-erosion of bivalve and limpet. Figure 15b: Modern bio-erosion of echinoid test. Figure 15c: Modern bio-erosion of coral. A bivalve has bored a 5mm diameter, flask shaped, cavity into coral in order to provide a safe haven for itself with access to the same food supply as the coral polyps. Figure 15d: Modern bio-erosion of coral. 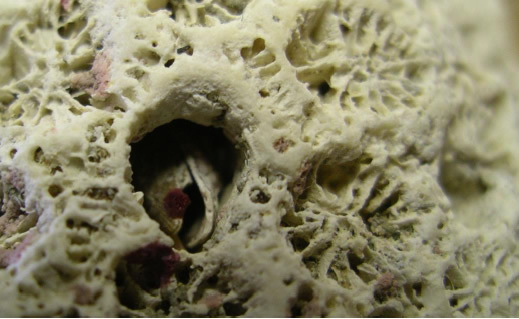 An unknown organism has bored a cylindrical 5mm diameter hole through this coral. In the Jurassic, for instance, such borings are made by segmented marine worms. Sedimentation rates today have been influenced by sea level rise since the last glaciation. In the Florida reef belt 14m of carbonate sediment has accumulated in 6000 years. Many coral reefs around atolls have also kept pace with sea level rise. Only about 10% of today’s carbonate production is associated with reefs and shallow water deposits; most of the remainder is plankton. The process of cementation converts carbonate sediment to limestone. Cementation may commence soon after deposition and/or during burial. Once buried, the interstitial space between grains of sediment is reduced by compaction and the water within this space is likely to be saturated with soluble carbonate. Over a period of time calcite fills the interstitial space and cements the calcareous grains together to produce limestone. Cementation is an extremely complicated process. For instance, one form of calcium carbonate, aragonite, is less stable than calcite and is very likely to be dissolved and re-precipitated as calcite. Pressure dissolution along grain contacts may occur when the depth of burial exceeds a few hundred metres. In addition, chemical dissolution may occur when pore-water fluid is undersaturated with carbonate. Evidence for dissolution is found in millimetre thick layers of insoluble residues. These may take the form of stylolites, thin seams that look like rather like the traces on an earthquake vibration recorder (seismometer), see Figure 16. Stylolites can sometimes be seen in limestone cropping out in the upper Ribble valley. Another form is a discontinuous thin seam, sometimes described as a flaser; this form can be seen locally but there is so much siliciclastic material in the Chatburn Limestone that unequivocal dissolution seams are not easy to identify. 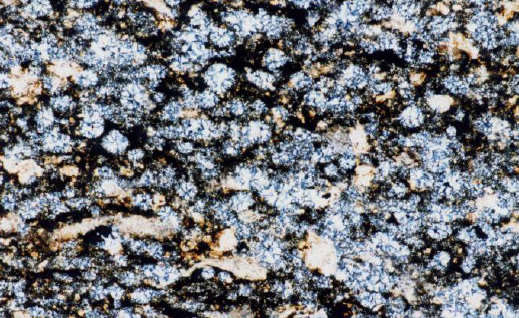 It is more easily identified in thin section, see Figure 17. Figure 17: A dissolution seam in Chatburn Limestone, viewed in thin section (a polished slice, 0.03mm thick) in plane polarised light. Dissolution seams show as dark lines. Scale bar 1mm. Extensive cave systems found in some limestone deposits are clear evidence of the solubility of calcium carbonate. In these cases water must have entered the system unsaturated and exited the system with increased concentration of dissolved carbonate. It was mentioned previously that sponges extract silica (SiO2) from sea water. The silica is opaline and in the form of spicules, which are shaped like needles. Biogenic silica is slightly soluble in water and more so in marginally alkaline water than in marginally acid water. Sponge spicules may be preserved, see Figure 18, or the silica dissolve and re-precipitate in areas where marginally acid conditions exist. Decay of organic matter creates local marginally acid conditions and provides a location for precipitation of silica to take place. 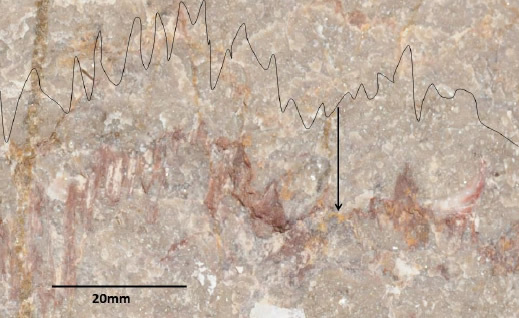 The result is chert, usually seen as black to grey lenses or layers in limestone, see Figure 19. 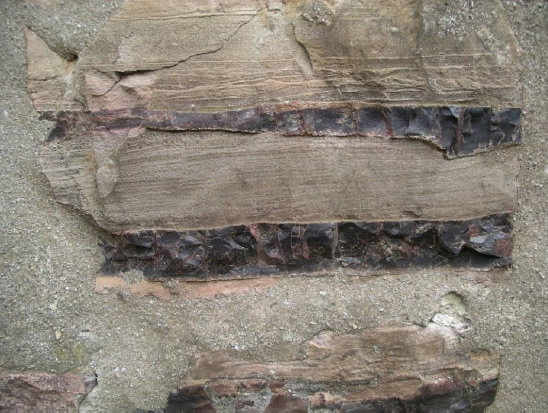 In some exposures of the Pendleside Limestone the chert clearly replaces limestone, as sedimentary structures such as bedding and burrows are preserved within the chert bands. When the layers are parallel to bedding and are laterally extensive it is likely that sponges flourished at that location or that a large quantity of spicules was washed in from nearby. ‘Chert in limestone’ is the equivalent of ‘flint in chalk’; they are both forms of silica. To distinguish between limestone and chert (or between chalk and flint) use a coin to scratch the surface. If the rock is chert (or flint) your coin will make no impression; it will just leave a metallic line where the metal has rubbed off the coin. If the rock is limestone (or chalk) you will make a groove in the rock and will probably be able to see rock flour along the sides of the groove; your coin will be undamaged. Fossil crinoid fragments are extremely common in some local limestone, for instance at locations 2 and 3. 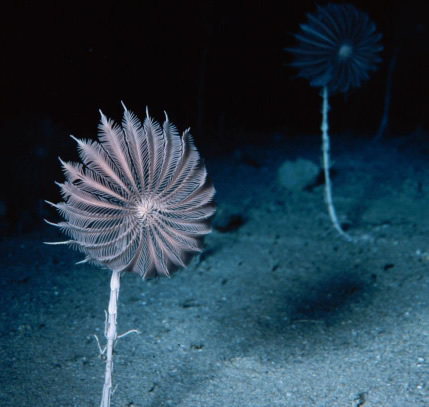 Despite their common description as ‘sea lilies’, crinoids are not plants but animals related to sea urchins. It is usually the stalk segments, called ossicles, which are preserved, often in vast numbers. 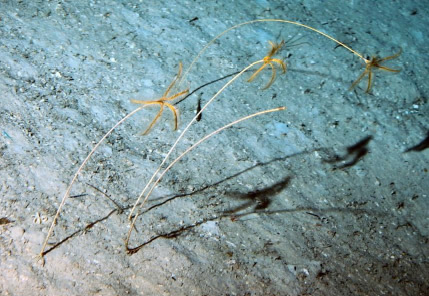 Today some twenty five genera of stalked crinoids live in sea water, deep enough for energy levels to be quite low. Their method of feeding is to extract organic detritus and small organisms from the water as it passes through their ‘arms’, so some current is required. 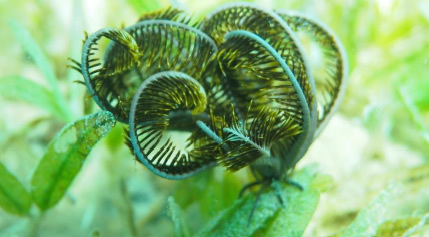 Crinoids transport their food along their arms to a centrally place mouth. Figures 20 to 26 show examples of living (stalked and un-stalked) crinoids. 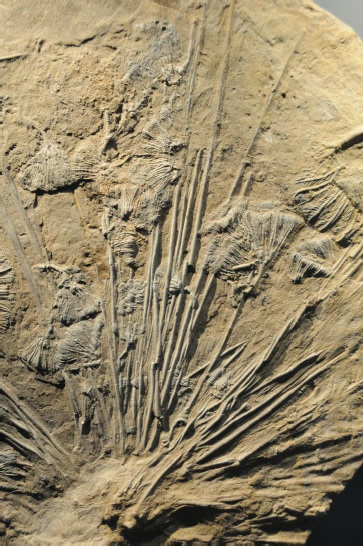 Figure 27 shows a fossil crinoid with stalk and arms preserved. Some living crinoids are capable of ‘walking’ by slow articulation of their ‘holdfast’, the means of attachment to the substrate. We tend to forget that fossils may be the preserved remains of brightly coloured organisms. 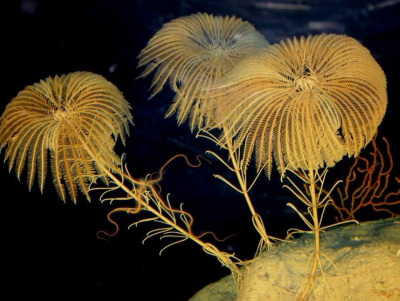 Modern crinoids are so attractive that I make no apology for including several pictures. Figure 20: Living crinoids. The holdfast, which secures the crinoid to the substrate can clearly be seen. Figure 22: Living crinoid, Democrinus cf rawsoni Roatan. Image kindly provided by Professor Charles Messing. Almost no crinoid species survived the end Permian extinction (250Ma), so although Democrinus is similar in from to some of those in the Carboniferous, the relationship is not close. Figure 23: Living stalkless crinoid from the Red Sea, not closely related to Carboniferous crinoids. 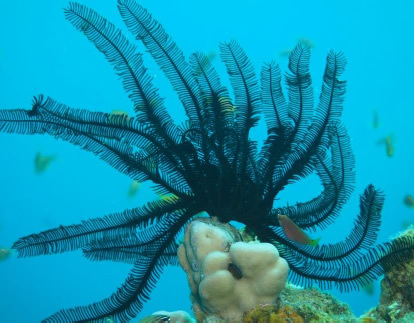 The holdfast, which secures this crinoid to an organic substrate, can clearly be seen. Image kindly provided by Dr Antony Jensen, Ocean and Earth Science, University of Southampton, National Oceanography Centre, Southampton. Figure 24: Living stalkless crinoid from the Red Sea, not closely related to Carboniferous crinoids. Image kindly provided by Dr Antony Jensen, Ocean and Earth Science, University of Southampton, National Oceanography Centre, Southampton. Figure 25: Living stalkless crinoid from the Red Sea, not closely related to Carboniferous crinoids. Image kindly provided by Dr Antony Jensen, Ocean and Earth Science, University of Southampton, National Oceanography Centre, Southampton. Occasionally spectacular examples of crinoids are preserved as fossils.